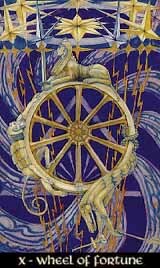 The Wheel of Fortune is a symbol of destiny and destination, of good luck and bad luck, of the ups and downs of life and fate. Everything is in motion, turning and floating, constantly changing, accidental and uncontrollable. The trump also represents the need to be careful, to realize and recognize the vaguarities of life, to accept the fact that fate is nothing what we could have done, but the result of what we already did. Today is the result of the past, future will be the sum of past and today, and no matter how accurately we plan, the Wheel of Fortune will mix up light and shadow. Whether the Wheel of Fortune is positive or negative is not a matter of happenstance or events in the first place; but rather of the way we will deal with the results, arrange our lives with the unchangable and work on what we might be able to change - and of course of our ability to realize facts.